/ Modified jul 31, 2017 2:14 p.m.
Cars drive down Campbell Avenue during a brief monsoon storm. From July 2017. 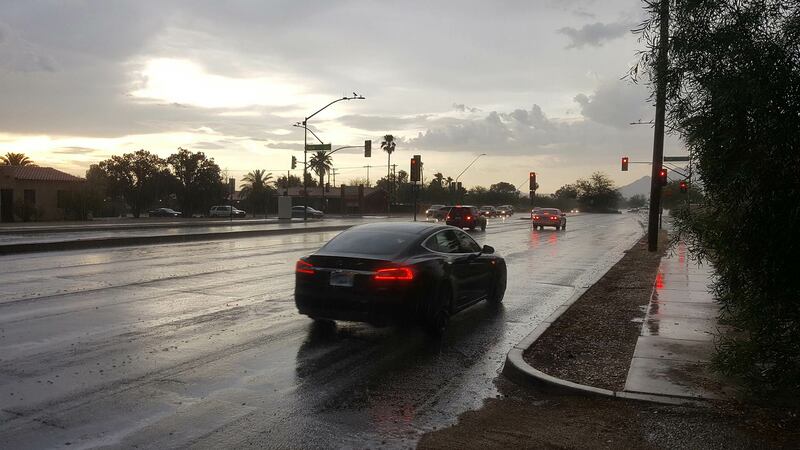 Tucson has just recorded its second-highest total for rainfall in a month ever. As of July 31, the weather station at Tucson International Airport had recorded 6.8 inches of rain. That is the most rain recorded in July, and the second-highest total recorded in a single month in Tucson. The rainiest month on record was August 1955, which saw 7.93 inches of rain. What caused the monsoon to start this strong? Davis said the extreme heat that hit the area in June and early July helped create atmospheric conditions that have brought significant moisture to the area. The month's end does not mean the storms will stop though. “The overall general pattern still looks favorable for additional rainfall, so we’re still expecting to get more rain at the airport and push those totals up even higher for the month of August,” said Davis. July’s total puts Tucson nearly halfway to the all-time monsoon rainfall record, set in 1964. That year, 13.84 inches of rain fell on Tucson between June 15 and Sept. 30.